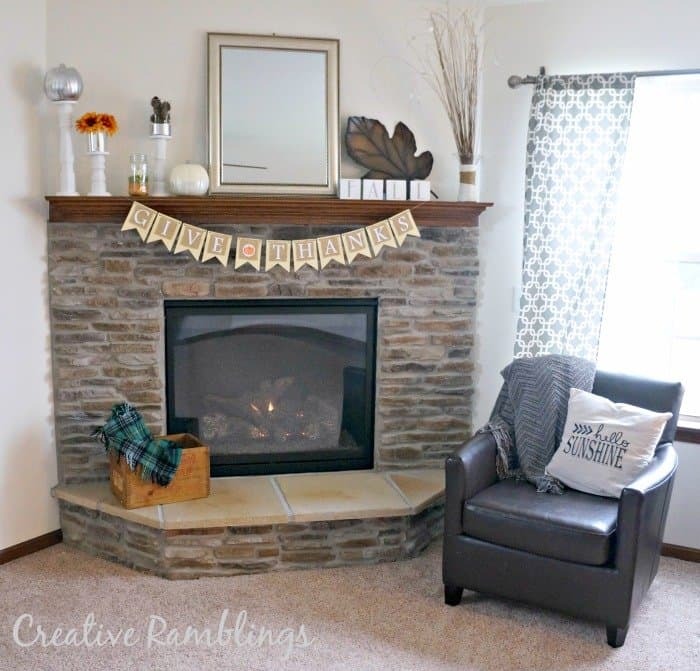 I finished my fall mantle this week and I am so excited to share it with you. The air has been crisp around here, which has led to boots, scarves, and warm drinks. This is my absolute favorite time of the year. Little Lady and I pulled out the fall bins and started decorating…and trying on every available costume she could fit into. It was so much fun watching her waddle around in her Little Mermaid costume strategically placing pine cones. It also kept her busy and gave me a chance to focus on the mantle. I went with a white and silver glam meets rustic theme this year. Oh I am in love. On the other side of the mantle I made a couple of candle holders, yes made, for under $20 for all 3. I’ll be sharing the tutorial with you in a couple of weeks. 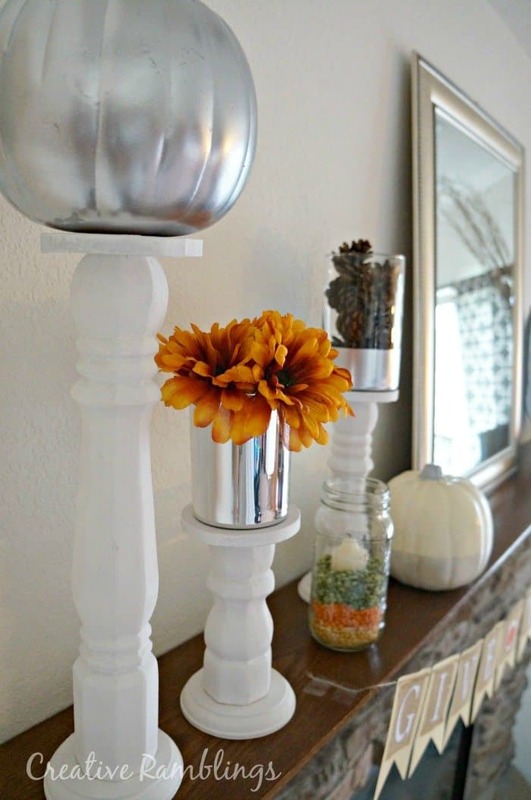 I used 2 of my favorite paints to embellish these pumpkins and jar. I sprayed the bottom half of a white pumpkin with glitter spray. A couple of coats were enough to add sparkle without completely covering the white. I used mirror paint to cover another orange pumpkin and the bottom of a glass vase. I love the look of that paint! I have so many of these particular mason jars on hand, they are Classico Sauce jars. It helps that we love the sauce, which keeps my supply stocked. I let Little Lady (by this time she was dressed as Tinker Bell) layer colored peas in jar. She loved helping and it adds just a bit of color to the mantle. 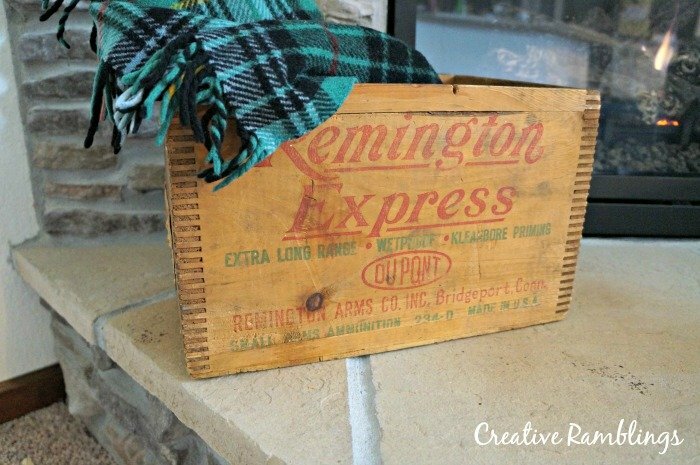 My amazing Father in law dropped of this old ammunition box the other day. He so gets me, I absolutely love this! I think this will be out year round, I can think of so many uses. 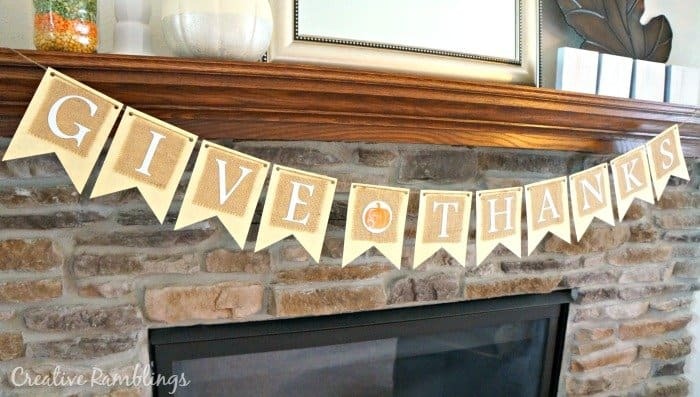 This banner is a fall best seller on Etsy and one of my favorites. I love mixing clean shapes and burlap. Be sure to follow along on Pinterest for lots more fall inspiration. 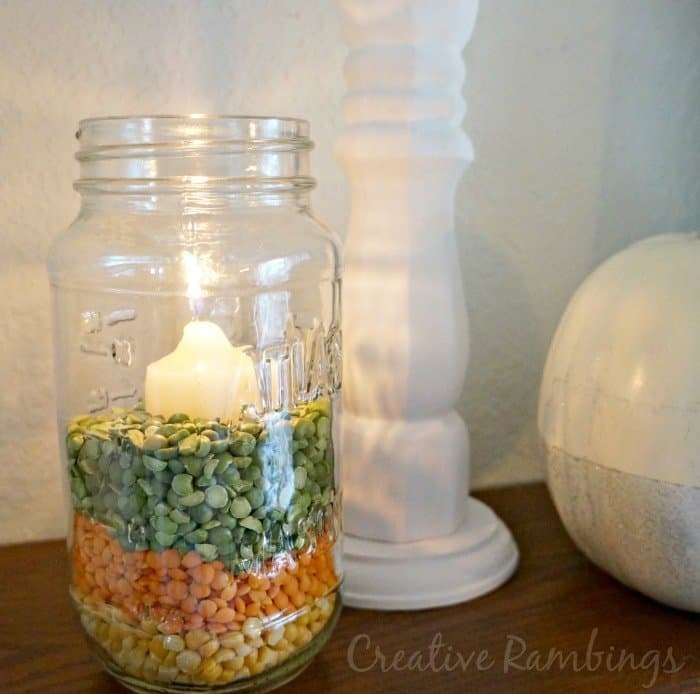 Visit Creative Ramblings’s profile on Pinterest. Looks great! 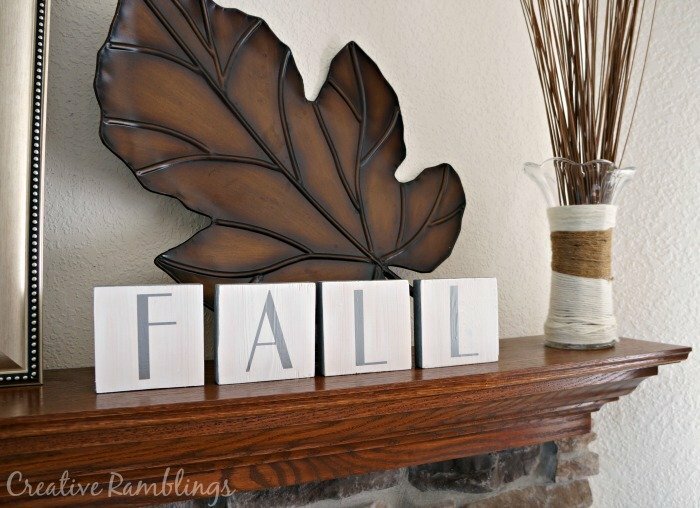 I love the Big leaf behind the Fall letters! Thank you, that is one of my favorite pieces year after year. Looks beautiful! I don’t have a mantel, but I’m going to be decorating the top of our piano this fall instead. 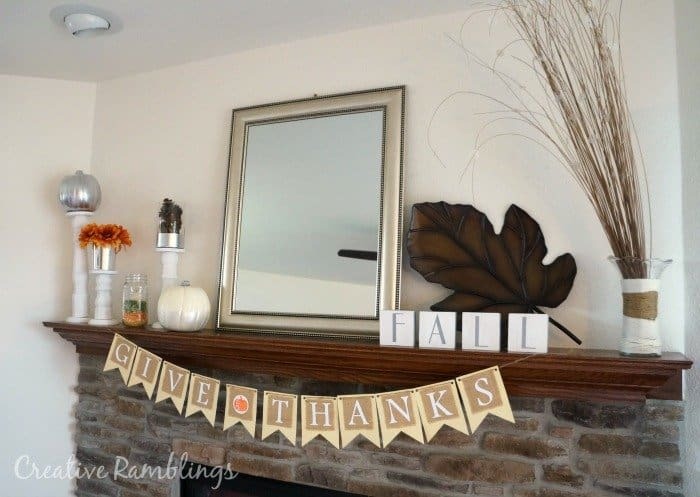 I’ve been wondering if it’s too early to start fall decorations – guess not! I’d be thrilled if you’d link up at this week’s Off the Hook! Have fun decorating, I’ll check out your party. Thanks for stopping over. I almost bought a can of the glitter paint yesterday. Now I have to go back and get it. I have used it on a number of crafts, you can add one coat for a little sparkle. This pumpkin took about 3 coats but I love how it turned out. Beautiful! Hi from Blogging on the side group. Hey Ranjani, thanks for stopping by. Glad you like it.